Assam official receiving award from C R Chaudhury, Union Minister of State for Commerce and Industry in the Award Presentation Ceremony held at Pragati Maidan, New Delhi. The new look of Assam Pavilion has been awarded the Gold Medal for Best State Pavilion in India International Trade Fair (IITF), 2017 amongst all the State and Union Territories. 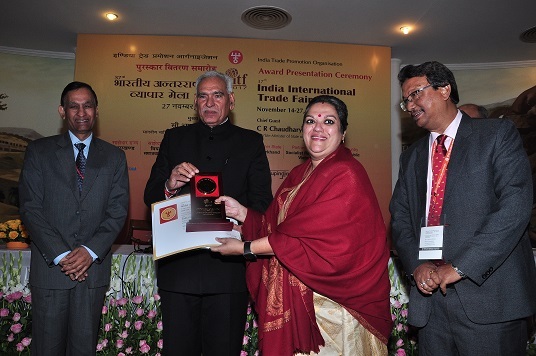 The award was presented by C R Chaudhury, Union Minister of State for Commerce and Industry in the Award Presentation Ceremony held at Pragati Maidan, New Delhi. In spite of the space constraint due to the dismantling of the permanent Pavilion Building, the temporary Assam Pavilion in the India International Trade Fair (IITF), 2017 this year was a picture of modern Assam focusing on the locational advantages it beholds due to its proximity to the ASEAN countries. The locational advantages of the state, the thrust sectors identified by the Government, the policies offered, were made available at the touch of a button in the eight touch screen panels and LED walls around the pavilion. The projections made through a Holographic machine, only of its kind in the entire IITF, 2017 made the pavilion informative and a must visit one for any investors. The stalls in which the MSME entrepreneurs numbering twenty displayed their products, were definitely a class on its own, as they were intricately constructed depicting the ethos and culture of the state. The bamboo wood flooring, bamboo wood panelled wall, water hyacinth mats on the stall counters were highly appreciated by the visitors. Besides the twenty MSME participants, seven government departments and organisations also participated in the Assam Pavilion.